It was a busy weekend for the BRDC Members, SuperStars and Rising Stars that were racing across Europe, North America and Asia but in London, Graeme Lowdon was burning a different kind of rubber. 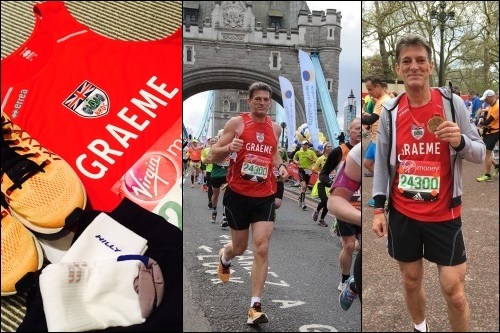 Running in his second London Marathon, Graeme completed the famous course in a time of 3 hours 56 minutes, generously raising money for the BRDC Benevolent Fund. "My time for the marathon was 3 hours 56 minutes which I was very happy with (over half an hour quicker than my time of last year). It was my 51st birthday on the Saturday (day before the marathon) so I had a small celebrations on the Saturday evening which was great fun although maybe not ideal for race preparation however I was much more worried about a heavy cold that I had picked up." "I was told that so long as I kept control of my running pace, the cold would be no more than an inconvenience and that proved to be the case. I have decided that I am not designed to go much beyond 38km under my own steam and I did find the last 4km very tough but I don't think that is unusual when you are running for 42km and of course I was running primarily to raise money for a very good cause which is great motivation in itself." The BRDC Benevolent Fund, now in its 16th year, offers support to people involved in the motorsport industry at times of need and the fund's board of trustees are very grateful for Graeme's contribution to the cause. Donations are still possible via this link http://uk.virginmoneygiving.com/GLOWD and any support that will take Graeme up to and beyond his taget would be greatly received. Congratulations must also go out to BRDC Members Sam Tordoff and Rob Collard who also completed the marathon on Sunday. Sam, running in his second London Marathon finished with a time of 4 hours 4 minutes to raise money for the Prince's Trust. Rob, running in his fourth London Marathon, finished with a time of 4 hours 32 minutes raising money for Snowdon Trust.